In 2015, on All Saints Day, the CEC collected $21,945.07 for the All Saints Day Mission Offering. The funds are distributed equally among the four General Secretaries (Bishops Koyo, Sekelwa, Emmanuel, and Gogo). They use 80% of the funds for development projects, so they can start their own businesses and they can decide how to spend the income; while 20% is designated “Mercy” to take care of their short-term needs. Bishop Charles Sekelwa sent the below report. 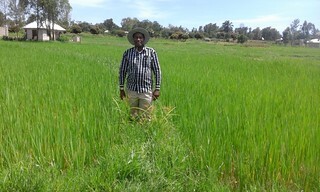 In my Diocese we decided to shift a bit from the Feedlot project to the “Rice farm project.” We leased some land (3 acres) and we farmed half of it, and our projection was to get 60-80 bags; but the end result has given us 63 bags and we thank God for this. I am sending you some photos showing step by step, from the farming process, harvest process and storing process. This time is low season we intend to sell the crops in October for a high price. Details will follow then. Having consulted in our House of Bishops, we decided to continue with our practice. We received about 9,524,130/= TZS from New York. We agreed to divide the funds between our dioceses so that in Dodoma they will re invest the 4,762,065/= on the FEEDLOT project and we agreed that at the end of October or beginning of November we will meet and figure out what profit we have made with the money and what to do then with the profit made. In high season our projection is that we will be able to sell each bag at around 75,000-85,000/= TZS we believe we will be able to make a good profit, detailed report will follow after the sale. We thank God that mercy funds have saved the life of my priest, Fr. Josephy Seni, who was seriously sick and admitted at the Hospital with a problem related to “HYDROCELE.” He needed surgery, but since the priest does not have the medical insurance, it was almost impossible for him to get treated. We have to pay around 600,000/= TZS to save his life. I am sending you a photo of me visiting him in hospital. We still have money and hope the funds will keep helping whenever the need arises.